For me, it’s hit and miss. Sometimes the lessons are clear, and I can start using them right away. But some, for me, are complete bombs. The failures usually go like this: I hit an obstacle, I furiously flip the book to the spot where I had the epiphany in a desperate search for answers that aren’t there, panic, admit defeat, let the lesson die, sulk, move on. How did it go so horribly wrong? He painted a clear picture of what it would look like in his classroom, didn’t he? Yes, he did. Is it me? Did I screw it up? Truthfully, yeah it was me . . . to an extent. It was also him, again, to an extent. But I have done the same thing with my students in the classroom time and time again. I nailed the lesson, and still they didn’t get it? But it’s so clear to me, how did they not get it? A few years ago, I discovered this phenomenon has a name: The Dunning-Kruger Effect. People of low ability have illusory superiority and mistakenly assess their cognitive ability as greater than it is. People of high ability incorrectly assume tasks that are easy for them are also easy for other people. In the scenario described at the top of the post, I am the first example of the Dunning-Kruger Effect, although I don’t like to think of myself as having low ability mixed with illusory superiority. I overestimate my aptitude to carryout the lessons and strategies in his books. Where I have failed, I wasn’t thinking the process the whole way through and how a particular strategy fit into how I structured my day, week, unit, or year. Context mattered, and I missed it. On the other hand, I speculate that Gallagher thinks he’s clearer than he really is. Now, before anyone gets defensive, hear me out. First, he’s great! But he strikes me as the type of guy who’s unaware, or unwilling to admit, that he’s great. He seems fairly humble. Another consideration here is that he has all that experience of teaching the Gallagher way. He’s seen his way through all the rough patches, the mistakes, and the missteps; he’s earned the victories he’s won. And when he writes it down for us, he can picture every bit of it. All of those twists and turns have been whittled down to a two to three page blurb in his book (and maybe we could blame the publisher for some of the whittling, I don’t know). In some cases, he writes just enough to get readers like me excited, painting just enough of a picture of happy and smiling students excited about reading and writing. And so I go for it. My overestimation in my ability, coupled with my misguided belief in my superiority meets Gallagher’s overestimation that I will “get it” and BOOM! Dunning-Kruger strikes in full force! Here are a few examples. Several years back, I tried to deploy the Sentence of the Week from Write Like This, and I went strong for about four weeks, then ran out of steam generating lessons every week. I also tried The Writer’s Notebook with my students, but that petered out too . . . multiple times (I did eventually figure it out, see HERE).. I got really excited about the classroom book club found in the pages of In the Best Interest of Students, but before I got moving on that, I thought, “he says nothing about how his students get access to all those books” and quit before I even started. Then I found myself saying, “I would pay someone to show me how to do this,” with several of his lessons and strategies. But does anyone out there have a how-to guide like that? I’m starting to feel guilty for being so critical, so I need to pause and acknowledge that no other teacher, whom I have never met, has done more to impact my teaching. Kelly Gallagher’s heart for his students, for his craft, and for English teachers everywhere is clearly displayed on every page of his books. I don’t know where I would be without them. There. The guilt has lifted (sort of), and I can get back to the answer to the question. Yes! There are people out there who are closing that how gap. Teacher-authors like Gallagher show us why a particular method works so well and why we should adapt our practice to include it. They even show us a little bit of what the methods and strategies look like with student samples. But the missing piece at times is the how. Teachers like me need to see how one goes from zero to amazing, showcase-worthy student samples. Last summer, as I was gearing up for school in the fall, and that grammar instruction feeling hit me again: I really want to do Sentence of the Week! And I wanted to include more Jeff Anderson-style grammar instruction in my class (Jeff Anderson is another great teacher-writer, and he and Kelly Gallagher have worked on some really cool stuff together, like RADaR). Instead of firing up PowerPoint and pep-talking myself for the long-jump into the process of building weekly grammar lessons, I put the thought out there, “I wish someone would just do the work for me, and I can pay them for it.” I started asking around on social media, I googled it, but I couldn’t find an answer right away. Serendipitously, I opened an email from a blog I follow: davestuartjr.com. Dave Stuart Jr. is a teacher who took Kelly Gallagher’s Article of the Week and made it even easier to deploy (see Dave’s version here) though he does much, much more than that. In that email from Dave, he talked about his friend Doug Stark and the lessons that Doug developed for teaching grammar in the style of Jeff Anderson! He called it Mechanics Instruction that Sticks (MITS). As I read about it, I got really excited. It was everything I wanted to do to teach grammar, and I didn’t have to build any of it! I bought MITS without much thought, and downloaded the files (MS word and PDF). Included with the purchase was a five-day email course, demonstrating how to use MITS in class. I didn’t deploy MITS in quite the same way Doug Stark taught, and I didn’t use all the material, but this year I am going to teach all the units and deploy most of the material (I needed a year to wrap my head around it, wading slowly into its depths). He needed to process it all in his own unhurried time. He said this enough that I thought, “You know, maybe I should write it down . . . in a book.” And I did! First, I needed to organize my own thoughts for me, but then I wanted to provide instructions for “teachers who get excited about the methods and ideas in Kelly Gallagher’s books” with a how-to guide for doing the most difficult practice I have ever brought to bear in my classroom over my 13-year career. 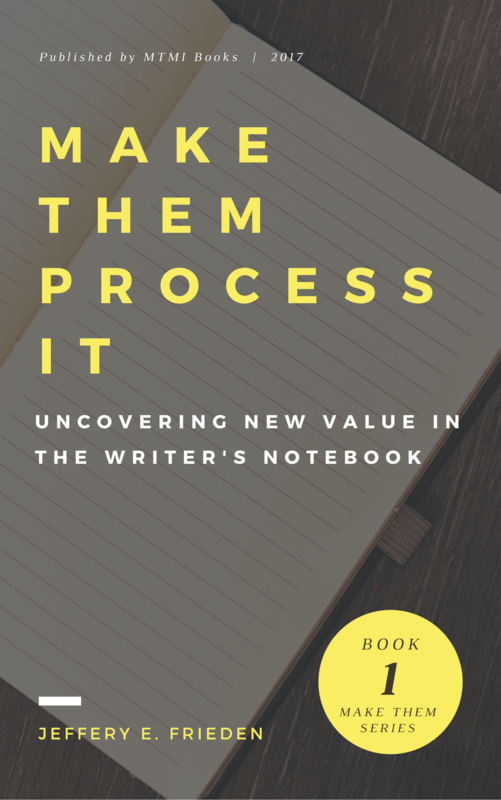 Last summer, as soon as school let out, I would start each weekday at Panera Bread as soon as the doors opened, typing out the pages of Make Them Process It: Uncovering New Value in the Writer’s Notebook. Click on the link to read a little more about the book and its contents: MAKE THEM PROCESS IT. Right here at makethemmasterit.com! Comment anytime! The book comes with plenty of bonus material to help you as you get started. And, if you contact me as you apply the methods and ideas, I would be happy to send you any additional materials I have developed since the book was originally published. But the best feature of the book, I think, is that it is short! It won’t take long to get through it, which gives you more time to apply the content. Question: What is something taught by amazing teacher authors you have always wanted to do in the classroom, but you just could not figure out how to make it work?